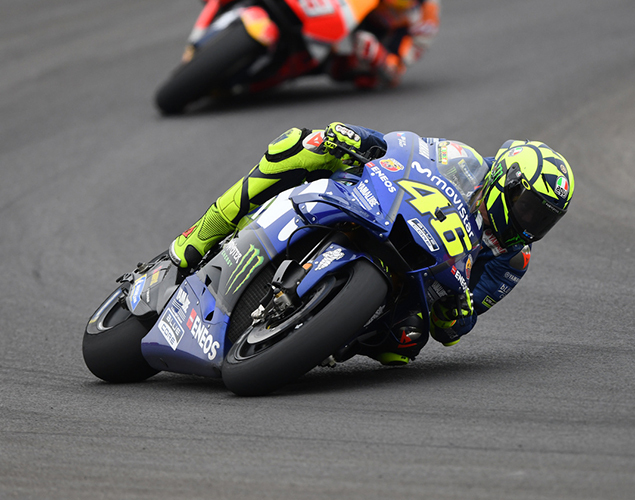 As the MotoGP riders and teams head to Circuit of the Americas in Austin, Texas, for this weekend’s Grand Prix of the Americas, we take a look at why 2018 is already lining up to be a classic MotoGP season. Cal Crutchlow is leading the MotoGP World Championship! 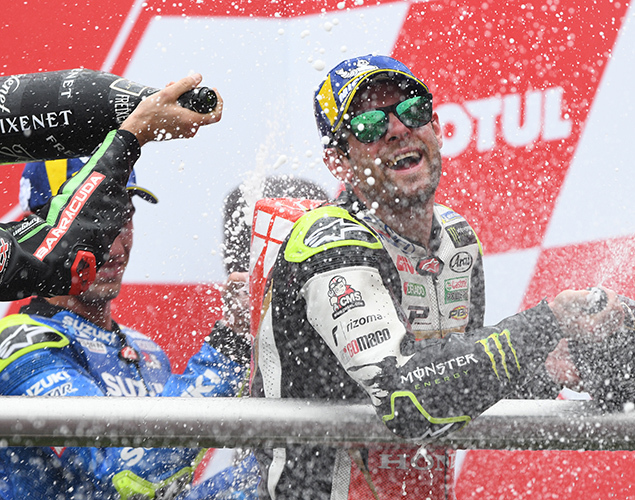 Britain’s very own Cal Crutchlow is the first Brit since Barry Sheene in 1979 to lead the premier class world championship! The 32-year-old, originally from Coventry, and now an Isle of Man resident. holds the accolade of three MotoGP wins in his career, after taking another impressive victory last time out in Argentina. Can he hold on to that three-point championship lead over Italian Andrea Dovizioso after this weekend’s race? The Manx-based rider seems confident with his LCR Honda team and factory Honda RCV, so let’s see. The Rossi and Marquez fight is all kicking off. Again. When Marquez took out Valentino Rossi in Argentina, MotoGP’s World War 3 kicked off. Marquez is often booed following his epic rivalry with the much-loved Rossi and taking out the legend will only power that hatred from #46 fans. We can’t wait for the press conference in America. 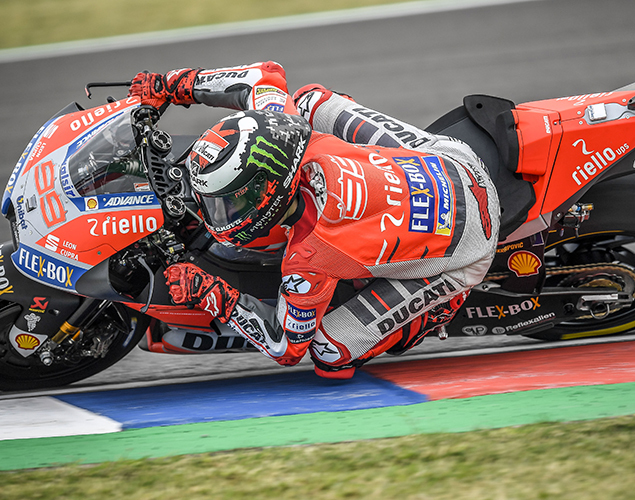 Despite flashes of brilliance which sees him very occasionally at the front of the group during FP1 and FP2, when it comes to the race day on his Ducati Desmosedici GP18, the three-times World Champion just isn’t getting the feeling he needs for consistent race pace. His Ducati team mate, Andrea Dovizioso sits second in the MotoGP World Championship just behind Cal Crutchlow and has already taken a victory this year. In comparison, Lorenzo is in lowly 20th place. Despite a MotoGP race win at a wet Assen last year, goofball Aussie Jack Miller has never quite fulfilled the promise and hope he brought for the Australians when he landed in MotoGP. Until two weeks ago in Argentina on his Alma Pramac Ducati. 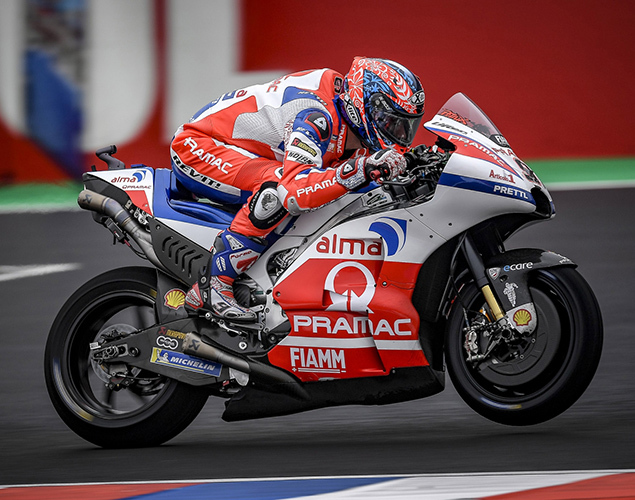 Slipping and sliding his way round a damp Autodromo Termas de Rio Hondo circuit in qualifying, the 23-year-old was the only rider to choose slicks for qualifying and stuck in firmly on pole and stuck his neck out on the line with some incredible saves. He may not have been ultimately able to make it count in the race, but he won a lot of fans in the paddock and worldwide. 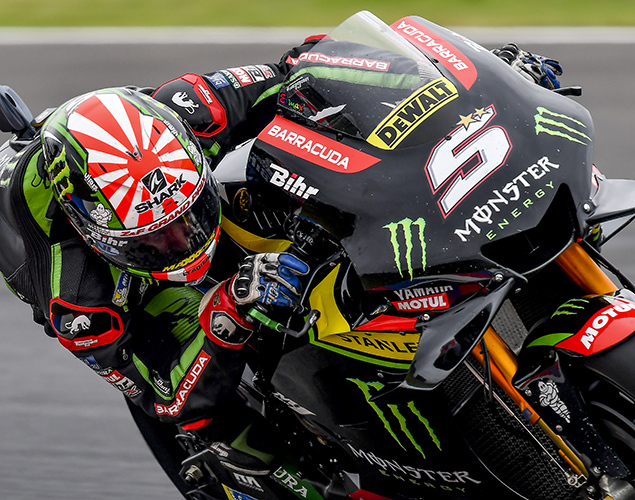 From Cal winning in Argentina, to Dovi winning in Qatar, it really is anyone’s race this year, and we’re seeing the rules tighten so that factory bikes and privateer MotoGP bikes are getting closer than ever on the track, witness two podiums and a pole position for Johann Zarco on the Tech3 Yamaha this season. Less than a second separated the top three riders in Qatar over the finish line. Qualifying can often see the top the bikes separated by just a second. From on-board cameras that can be spun 360 degrees, super high-definition 4k quality, and every single second of every practice and qualifying session, the TV coverage this year may be expensive on BT Sport and MotoGP.com, but it’s worth it for MotoGP super fans to really get at the heart of the action. 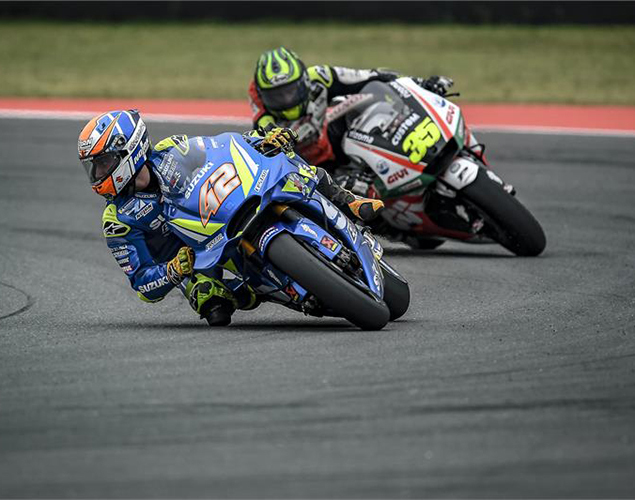 They may have had podiums and a race win at the British MotoGP in Silverstone in 2016, but 2017 wasn’t a premier year for Team Suzuki Ecstar’s MotoGP effort, as they failed to score a single podium with MotoGP rookie Alex Rins and Andrea Iannone last year. That looked like it all changed in Argentina as Rins lead the race, and finish on the podium. Rins even said after winter testing that the new Suzuki GSX-RR is said to be ‘100 times better than last year’s bike’. A win is surely on the card this year for the team. Six Brits to cheer on! From Cal leading the MotoGP World Championship, to Bradley Smith making progress with the still relatively new KTM, and Scott Redding getting to grips with the Aprilia – there’s plenty for Brit fans to be excited about in MotoGP. 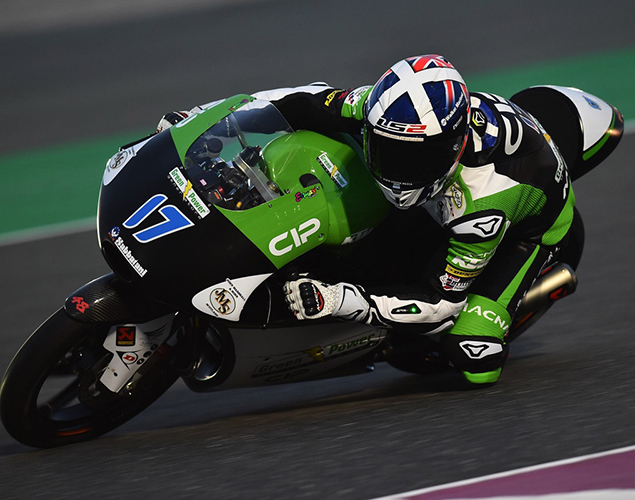 Then there’s Moto2 with fighter Sam Lowes making his comeback in the middle class on a KTM, 2015 Moto3 World Champion Danny Kent looking to rebuild his career in Moto2 on a Speed Up bike, and Scottish hero John McPhee on a KTM but in Moto3. And, the British MotoGP at Silverstone on August 24-26 is just a few months away.